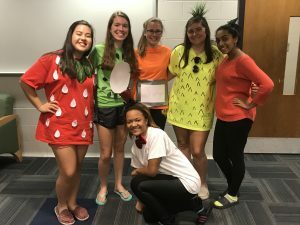 The CWIT Living Learning Community (LLC) provides opportunities for women and their allies majoring in an computing or engineering discipline to bond with other students in the same field and create lasting support networks. Living in the LLC provides many benefits for its residents – being surrounded by friendly, like-minded students with similar interests, easy access to study groups with other LLC residents taking the same COEIT classes, and additional social, academic and professional programs provided by the CWIT program and the Office of Undergraduate Education. What’s happening on the floor this year? First-year students on the CWIT LLC and first-year CWIT Scholars are required to enroll in a one-credit first-year seminar course during their first semester. Incoming freshmen, returning LLC students, and CWIT Scholars are given priority when applying for the LLC; however, all students interested in IT and engineering disciplines are encouraged to apply. The CWIT LLC application is attached to the Office of Residential Life’s online application for on-campus housing. In the online application, you should indicate your interest in the CWIT LLC and then you will be asked to complete an additional LLC application. NOTE: Your application to the CWIT LLC does not guarantee that you will be placed on the floor – we receive many applications and have limited space available. I recommend that you have a back-up plan for living elsewhere on campus if you do not get placed on the CWIT LLC. All selected students who are male-identified are required to enroll in CWIT’s Allies in CWIT group which meets regularly throughout the year. Current students living on the CWIT LLC floor can apply to live on the floor for next year by applying to be a Peer Assistant. 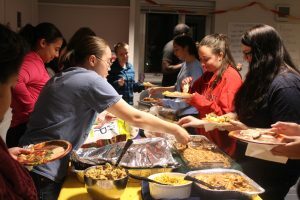 As a Peer Assistant, a volunteer position, students have the opportunity to develop leadership, programming, tutoring, and marketing skills while having a positive impact on the community. NOTE: Your application to the CWIT LLC does not guarantee that you will be placed on the floor – we receive many applications and have limited space available. I recommend that you have a back-up plan for living elsewhere on campus if you do not get placed on the CWIT LLC. Contact Erica D’Eramo at deramo@umbc.edu for more information.